I have recently begun performing my scholarship in different ways. I want to promote scholarship as (always) a performance, which is assessed in terms of the effects produced and the responses evoked. Scholarship is not only the transportation of information but the trans-formation of the audience and the field—what effects and responses do we want to produce or evoke? These are always the questions with respect to scholarship: such new media production methods throw these concerns into sharp relief. They make questions of impact and effect salient once again and in new ways. Here is a smattering of my video and audio projects. Click through for the project page. Video reiterating a talk I gave at UT Austin's Digital Writing and Research Lab. This video is a capture of the live-stream for the Indiana Digital Rhetoric Symposium 2015, held at Indiana University April 9-11th. I appeared as a guest on Eric Detweiler's fantastic podcast Rhetoricity. Small talk: it's both part of the lifeblood and part of the awkwardness of academic conferences. "Is your hometown treating you well?" "How about this weather?" "When did you get in?" The questions and answers are almost predetermined. Pushing the boundaries of this chatter, one might say, is a rhetorical project, and so this episode features two rhetoric scholars doing just that. Nathaniel Rivers (St. Louis University) and Jenny Rice (University of Kentucky) try out an array of alternate small-talk topoi, from questions about crying to old-timey firefighters to blood. Draft (very much so) of a video project Casey Boyle and I are working on using the HAL9000 aesthetic to work through Bruno Latour's An Inquiry into Modes of Existence. PeoplePlaceThings is a podcast about the situations created by people and (their) things. I co-produce this with Casey Boyle. The world is full of things that everyday work with, for, against, and sometimes quite apart from us. Not just in simple, instrumental tasks like mowing the yard, cutting our hairs, or trimming our toenails, but in our sense of ourselves and our place in and movement through the world. Our daily lives are built around complex and often intimate relationships with both human and nonhuman others. These relationships are rhetorical, they persuade us toward certain actions and bring us together in ways that we cannot always explain. PeoplePlaceThings is a podcast produced, in the style of Radiolab and 99% Invisible, to explore and explain these often hidden but nonetheless important relationships. A stranger, rhetorical understanding of our world emerges when we linger over these situations that we often take for granted. In this episode, I talk to Nathaniel Rivers. We talk about “things,” which are a lot more complicated than you might think. Our conversation ranges from academic conferences, ant vomit, contacts, pheromones, and material rhetoric. Midway through the podcast, Brad Vivian makes a serendipitous appearance and talks about things. Recorded in May 2014 at the Rhetoric Society of America conference. Short video produced for the journal Itineration and their "Big Ideas" series. A video component of a larger, collaborative project on new media science writing pedagogy. I set the wonderful images of National Geographic producer Peter Chinn's to music. I produced this short video as an example (for my students) of how "re-writing" a text can alter it's meaning and impact. The images are from the documentary "In the Womb" and the song is "Var," an instrumental piece by Icelandic band Sigur Ros. I pulled the images from here. 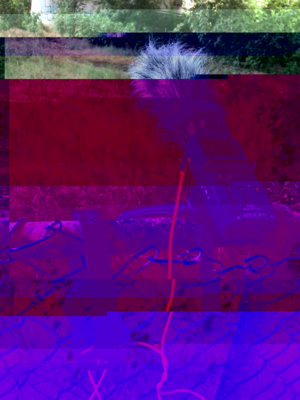 An experiment with image glitches. A very short video outlining why I think the work of Bruno Latour is important and necessary for rhetoric and composition. This video is part of a larger series of videos I produced for the journal Enculturation. A response to Dan Anderson's "Works with Materials," which is part of his excellent web-based book project Screen Rhetoric and the Material World. "Alien Relationship" (Video Project). OO Frequency: An Object-Oriented Media Channel. O-Zone: A Journal of Object Oriented Studies. Spring 2012. Nathaniel Rivers, an Assistant Professor of English at Saint Louis University who teaches rhetorical theory and writing, engages in this video in an experiment in what Ian Bogost calls “carpentry” and what Jim Brown calls “rhetorical carpentry,” in order to reveal nonhuman/nonhuman relationships as they take place alongside human/human and human/nonhuman relationships. “Alien Relationship” combines text from Devin Johnston’s Creaturely and Other Essays, images taken using the Instagram App on Rivers’s iPhone, and a sound effect (“white noise in the house” from klankbeeld at freesound.org). Rivers discusses this video experiment in more detail here. Experiment combining text from Devin Johnston's Creaturely and Other Essays, images I took using the Instagram App on my iPhone, and a sound effect ("white noise in the house" from klankbeeld at freesound.org). It's an early attempt at what Ian Bogost has called "visual ontography," which attempts to capture some aspect of "the awesome plenitude of the alien everyday."